A new communication and social therapy group has been set up at QEQM to help rehabilitate patients and support them in daily life following a stroke. Strokes often cause temporary or permanent paralysis on one side of the body. Balance, memory, speech, cognition and vision may also be affected. One of the most serious complications of a stroke is the ability to communicate afterwards. The initiative at East Kent Hospitals, gives patients the opportunity to receive support for a range of activities such as sentence completion, turn-taking, mobility, transfers and orientation. Lydia Showan, one of the scheme’s coordinators, said: “Patients are often worried, frightened and unsure of their future. They have to learn to cope with huge changes which can be difficult, challenging and can become isolated as their friends and family aren’t sure how to cope. 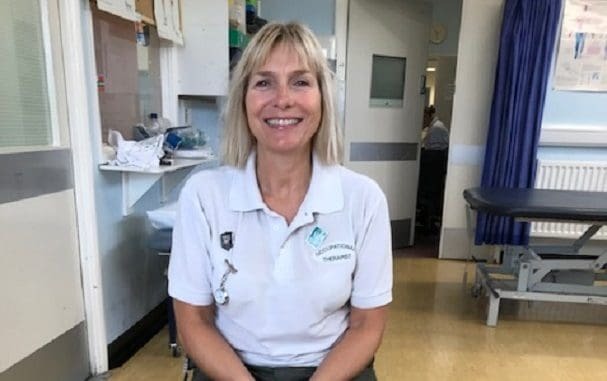 “The aim of the therapy group is to provide a more holistic approach to stroke rehabilitation, recognising that patients’ independence, engagement and ability to communicate is paramount to their recovery. The group began in August and feedback from patients attending the group, who have a diverse range of needs, has all been positive and has meant a huge increase in their confidence to communicate with others. It would be good to have more details about this. It’s great that there is help with rehab being offered at QEQM, but it would be helpful to understand if what is being provided is care from trained, paid staff, or if it is supplied by unqualified volunteers. And of course, whilst rehab and aftercare are extremely important in the treatment of stroke, this does not make up for the fact that under the stroke proposals (that are now in their final stages), all suspected stroke patients in Thanet will be taken to Ashford rather than QEQM in an emergency, which is a one hour journey away.